I’ve seen it called the “Must Have Survival Gear of 2014″ the LifeStraw Go is, in my opinion, making a strong case to be included in any survival kit. In the 17 survival situations I have been in… just kidding, but how often in the shows (that yes, are often scripted or manipulated) on TV do you remember someone eating water they shouldn’t, or being forced to make that decision? The human body can only survive 3 days without water, water aids should be the a primary focus of any survival kit. You should always include a sheet of plastic so you can make a solar still or collect rain water if possible, and you should always include a water purification method, be it a tablet or a filter. 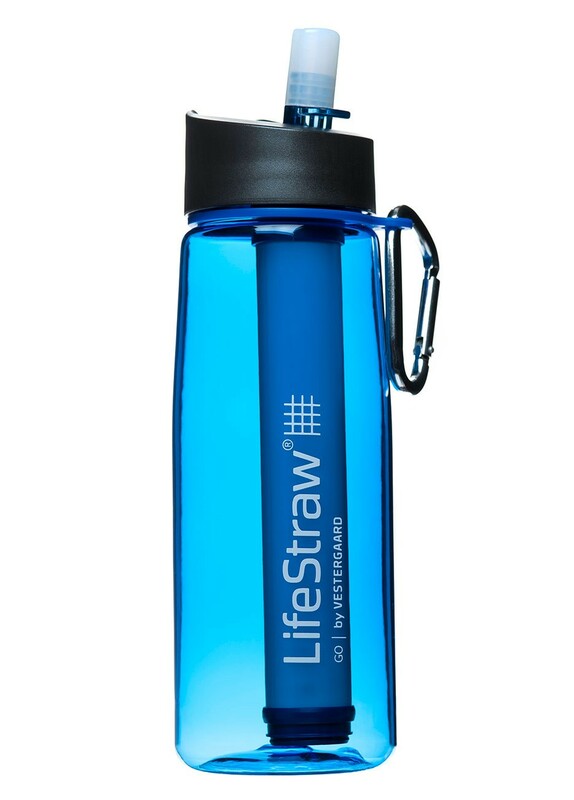 So LifeStraw Go is a self filtering water bottle. You fill it up with the most rank stagnant water you can find, and then just drink, your suction action pulls the water through the filter, or straw, and it cleans it. I’ve seen of course filtering straws before, and that makes sense as a survival gear item, but what happens when you need to walk away from the source of water? A vessel to carry water is always a good idea, this kills two birds with one stone. The bottle itself is made of “BPA-Free Tritan” if you care. Personally, I don’t. The Europeans have even so far declined to ban BPA, and they ban everything. It seems pretty strong. I’d prefer an aluminum bottle, or stainless steel, because then you also have a cooking vessel (everything in a survival kit should be a multitasker!) Maybe next year. The hard date. This thing will filter down to 0.2 microns, they say it’ll get rid of 99.9999% of waterborne bacterial and 99.9% of waterborne protozoa, in addition to particulate matter of course. The filter is good for 1,000 liters or 264 gallons. It clocks in at 6.7 ounces empty and includes a sturdy carabiner to latch it into belt or backpack. Theoretically you could construct a survival kit to fit inside of it and have a nice sturdy package. It holds 22oz when full, and promises to filter the following bad guys (among others): e.coli, campylobacter, vibrio cholera, pseudomonas aeruginosa, shigella, salmonella, giardia lamblia (beaver feaver), cryptosporidium parvum, entamoeba histolytica. Originally developed to save lives after natural disasters (like you could parachute a bunch in to an area hit by a natural disaster – like after the Haiti earthquake I think more people died from disease than houses falling on them) the company wishes to continue to give back, so for every one of these you buy one school child in Africa gets clean water for a year (they say). Is there anyone here that can snag a fish by the lip and pull it from the water? If there is would you share the technique? Independent reviews of products in the survival, prepping, homesteading, outdoors, gardening realms.